ELM GROVE — When the Madonna softball team has been able to get on the field this season, it has been successful. Now that the weather is starting to cooperate with the Blue Dons, they are rolling just in time for the sectional tournament. 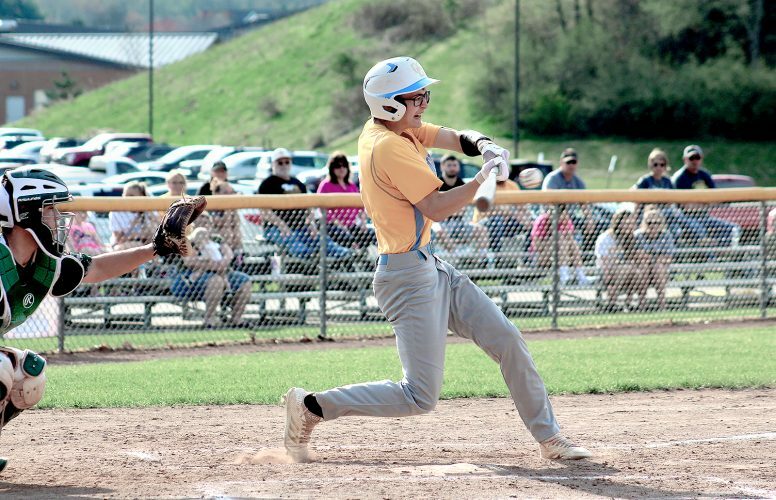 Coach Chris Conti’s club opened the tournament in style Tuesday night at the I-470 complex, pulling away from Cameron right from the start to take a 14-0 win. Katie Gasvoda went the distance in the circle for the Blue Dons (12-2), giving up just one hit while striking out seven and no walks. She had a big day at the plate, too, driving in three runs with a pair of hits. Conti wanted to see his team get off to a good start, and it did by jumping out to a 4-0 lead in the bottom of the first. Gasvoda knocked in a run with an RBI groundout, and Maddie Daughtery singled in another right after. The Blue Dons efforts were helped by a pair of Dragon (4-11) errors, the first of nine in the game for Cameron, and starter Emily Broughton did not make it out of the inning. “We started out with those four runs in the first inning,” Conti said. “I always tell the girls we’ve got to jump on them early and we did. We just never quit. We hit the ball and they made some mistakes. While Gasvoda kept putting up zeros, the Madonna bats kept adding to the lead. Gasvoda knocked in a pair of runs with a single in the bottom of the second. Jaedyn Kush drove in another, and more errors led to a six run onslaught that drove the lead to 10-0. 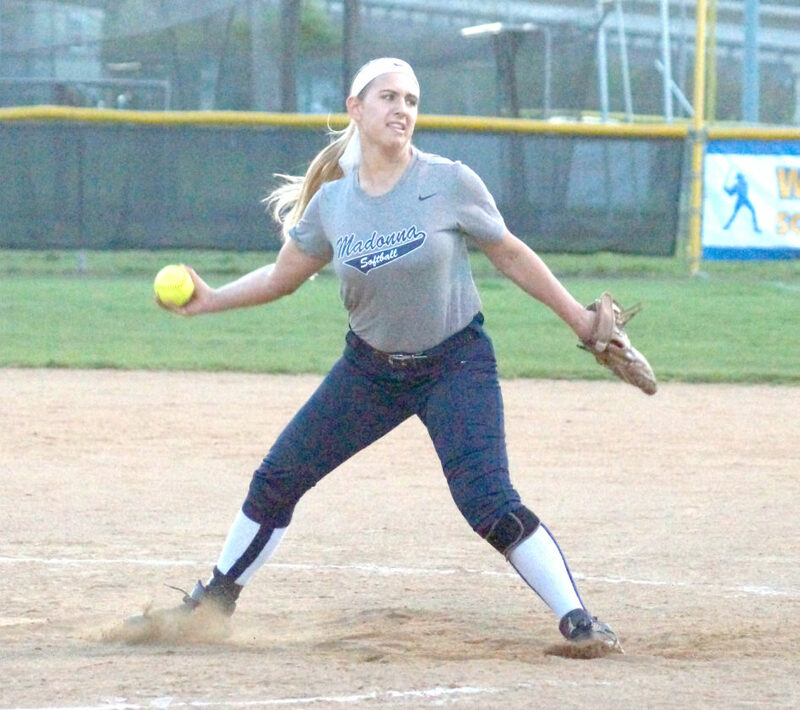 Gasvoda lost her bid for a perfect game in the top of the third when Maddie Cumpston reached on Madonna’s lone error of the game, then the no-hit bid during the next at-bat when Emma Whipkey singled on a ground ball into shallow right field for what ended up being the Dragons’ lone hit. Gasvoda responded by striking out the next four batters she faced. Madonna added two more in the bottom of the third. Sophia Recrosio, who had three hits and four runs scored, scored on a throwing error after singling. Daughtery then tripled and scored when the Dragons’ outfield threw away the relay throw. Karena Recrosio drove in Gianna Mascio, who reached after the Dragons threw away a dropped third strike, and Sophia Recrosio tripled and scored to drive the lead up to 14-0. Gasvoda took care of business in the top of the fifth to enact the mercy rule and end the game. Cameron faces Hundred at the I-470 complex today. Madonna’s next game will be Thursday, back at the I-470 complex. Conti was not sure who they would be playing quite yet but said the game would be at 6 p.m. The win marked Conti’s 299th of his career, but he was not ready to talk about any kind of milestone just yet. CAMERON (4-11): Broughton (LP, 2/3IP, 4R (3ER), 2H,, 0K, 3BB), Pekula (2/3IP, 2R (2ER), 1H, 0K, 1BB), Sharpenberg (2 2/3IP, 8R (6ER), 7H, 1K, 1BB) and Cumpston. MADONNA (12-2): Gasvoda (WP, CG, 0R, 1H, 7K, 0BB) and J. Kush. TWO OR MORE HITS: Madonna (S. Recrosio 3, Gasvoda 2, Daughtery 2). DOUBLES: Cameron: None; Madonna: 1 (K. Kush). TRIPLES: Cameron: None; Madonna: 3 (S. Recrosio, Daughtery, Mascio). HOME RUNS: None. RBIs: Madonna (K. Recrosio, Gasvoda 3, Daughtery, J. Kush).